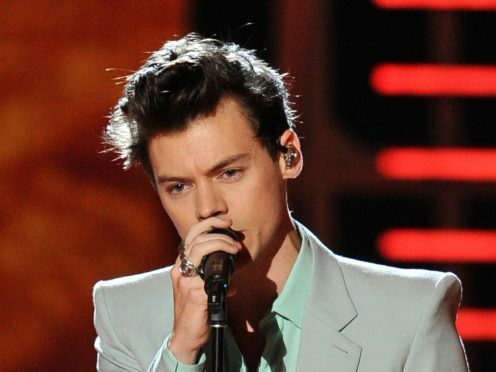 Harry Styles has paid tribute to Elton John by wearing a Halloween outfit inspired by the Rocket Man singer’s famous performances at the Dodgers Stadium in 1975. In a photo posted by John to social media, the former One Direction star, 24, is seen at a party in Beverly Hills organised by the Casamigos tequila brand. In the snap Styles is seen wearing a glittering baseball-style outfit with the word ‘Dodgers’ written across the front of it. The Sing Of The Times hitmaker also wears a pair of glitter-covered oversized sunglasses and a baseball cap. The Crocodile Rock singer tagged Harry Styles and the brand Gucci in the post. The party was also attended by Foo Fighters frontman Dave Grohl and Paris Hilton.